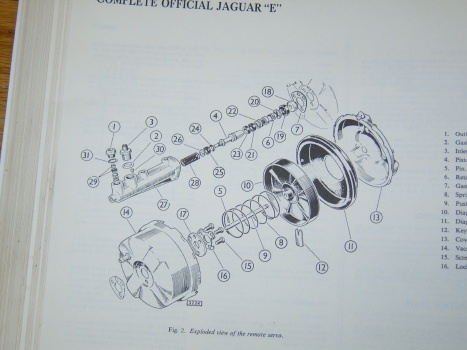 As we ended our previous article, I had acquired a 1967 Jaguar E-Type 2+2 with some known mechanical problems, including inoperative brakes and a frozen clutch disc. I was working on getting these problems resolved. 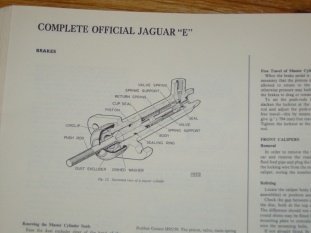 As I discussed in my last article, the E-Type brake system is rather involved. Now that I had rebuilt the components, I decided to install them back into the car. The master and slave cylinders should be “bench bled” before installing them. Directions for this process are available in the shop manuals but the general idea is to fill them with fluid and expel all the air. I then installed the master cylinder, slave cylinder, and the vacuum booster with its various rubber vacuum lines. There is a good diagram in the Bentley manual to show how everything should be plumbed. By the way, at this point I had not tackled the wheel cylinders and disks at the rear suspension unit. On the E-Type, the rear brakes are mounted “inboard”, near the differential. This design reduces the “unsprung mass” out at the wheels. It is one of the many small things that racecar designers do to improve cornering and handling. On the E-Type, it also makes it almost impossible to reach the brake parts for maintenance without dropping the entire rear suspension assembly. I decided to put this off for the time being, fearing what I would run into when I tried to remove the rear suspension. So I installed all the pieces at the firewall and reattached the brake lines leading to the front and the rear wheels. I bled fluid through the lines to my Volvo calipers and was able to get a solid pedal, albeit with no power assist as the engine was not running and there was no vacuum available. Next I decided to fire up the engine, in order to establish a vacuum source and see how the power assist worked. There was a definite difference to the pedal feel when I applied the brakes. But at some point I realized that the brakes were not releasing after I removed pressure from the brake pedal. This was not good! I engaged in some initial troubleshooting. If you find that your brakes are not releasing, the first thing is to establish if the problem is at one wheel or at all the wheels. If the car is drivable, this may be obvious if the car pulls to one side under braking. In my case, since the car was in my shop, I simply got the wheels off the ground and tried to turn them. I found that both front wheels were locked. If only one wheel is locked, it may be due to a sticky caliper or a rubber brake line that is so old that it collapses internally and becomes a sort of one way valve. In my case, I pulled one of the vacuum lines leading to the brake booster unit and the brakes immediately released. From this I was able to discern that the problem was probably with the vacuum booster system rather than with the hydraulic system. 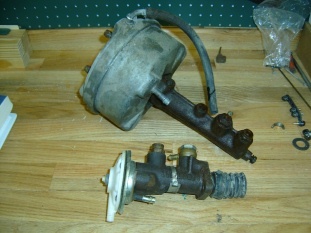 It turns out that the problem resided with the mechanical interface between the master cylinder and the reaction valve. In the setup used on my E-Type, the reaction valve is mounted directly to the end of the master cylinder. During my rebuilding of the master cylinder, I found that there is a small metal cylinder fitted at the end of the master cylinder. This cylinder moves outward from the master cylinder when hydraulic pressure is applied, pressing on the reaction valve, and causing it to actuate, which introduces vacuum to the brake booster. When you let up on the brakes, the cylinder is supposed to retract, which allows the reaction valve to close, and removes vacuum from the booster. In my case, the cylinder was not retracting properly, causing the vacuum to remain on the booster, thus locking up the brakes. When I rebuilt my master cylinder, my rebuild kit contained a small o-ring for the actuating cylinder, which I duly replaced. The o-ring serves to seal the cylinder so hydraulic fluid cannot leak by it. It seems that the o-ring sealed a little to well and caused the cylinder to hang up in the extended position. After I eventually discovered this problem, I had to “exercise” the cylinder by hand quite a few times until it was broken in enough to retract on its on. Problem solved, but it certainly took quite a bit of detective work to find the problems source! After congratulating myself on being able to diagnose and solve this problem, I was anxious to get on with my project. With my new found confidence for things hydraulic, I proceeded to remove the clutch master and slave cylinders for refurbishment. It is not easy to get at the slave cylinder for the clutch, as it is jammed into the very narrow space between the transmission bellhousing and the sheetmetal “hump” that enclosed the transmission. But I was able to get it out and was pleased to find that both cylinders were in good enough shape to warrant honing rather than having to be re-sleeved. I had purchased new rubber parts for the cylinders from Terrys and thus replaced the old rubber parts with new ones and bench bled the two cylinders. Speaking of bleeding, all hydraulic systems are set up to allow air to be bled out of them. Air in a hydraulic system is bad, since air is much more compressible than hydraulic fluid. A little bit of air in your hydraulic system will cause you to have a “spongy” brake pedal. More than a little air will cause you to have to “pump up” your brakes each time you use them, which is obviously a safety hazard. So when one re-assembles any hydraulic system, it is imperative to expel all the air from the system by “bleeding” the system. This process is discussed in most shop manuals. The reason I bring it up here is that normally there is a vent point or bleeder screw at the highest point of each wheel cylinder. The air naturally rises to the top of the cylinder, where it can be expelled easily. On the slave cylinder for the E-Type hydraulic clutch, the vent point is on the bottom of the cylinder! This flies in the face of all my expectations about hydraulic systems. Upon seeing this for the first time, I performed a search of the JagLovers Archives. I was not the first person to notice this situation, as I turned up several postings in this regard. The bottom line seemed to be put it together, bleed it in a normal fashion, and expect to use a lot of extra hydraulic fluid as you blasted the air downward to the bleed port. All I can say is that I did just that and was rewarded with a reasonably firm clutch pedal. I was paying special attention to my clutch pedal since I was not able to get the clutch to release. With my lovely assistant (my wife) pushing on the clutch pedal, I could clearly see the release lever that enters the bellhousing moving properly. Yet with the motor running, I was met with much grinding noise as I attempted to engage the gears. I still wasn’t in a position to try the recommended trick of jacking up the rear of the car and standing on the brakes. Remember, I had by-passed the rear brake job at that point! So I decided to go for the ultimate solution. Next month: How I Got My Clutch To Release or Harve’s Wild Ride! I found this blogg really useful – thanks. I have a similar problem… My brakes are stuck on. I disconnect the hose at the driver side of the Reaction Valve (from the vacuum tank) – this completely disables the servo assistance. This hose is always creating suction. I then disconnect the hose from the front of the Reaction Valve (going back to the top of the Servo)… this hose is NOTcreating suction. Can you tell me… is this correct? The operation of the vacuum system is such that the hose that goes to the front of the booster should always have vacuum. The hose that goes to the back of the booster has vacuum when the brakes are not applied and has normal atmospheric pressure when the brakes are applied. Early on, I inserted a tee into the line that goes to the back of the booster and observed the appropriate change from vacuum (~ -14 psi) to ambient (~0 psi)as I applied the brake and then back to vacuum when I released the brake. If when you release the brake it does not go back to vacuum, the most common cause is that the little metal actuator piston at the end of the master cylinder is not retracting properly. The next possible cause is a bad reaction valve. You can manually test the reaction valve by removing it from the end of the master cylinder and pushing into it with your finger, to simulate what the actuating piston does. Of course, all of this is done with the engine running (or with an alternate source of vacuum applied). I hope this helps.